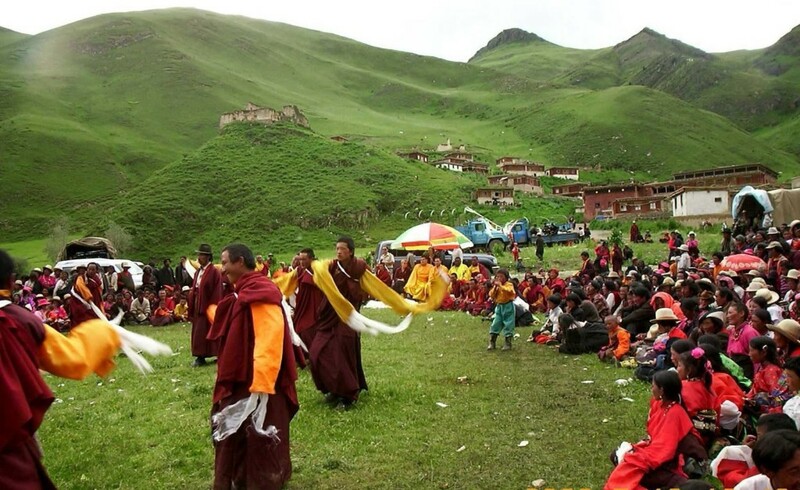 Capping a decade-long effort, plans are now underway to complete and launch the shedra or monastic college at Surmang Dutsi Til monastery in eastern Tibet. This new shedra is a magnificent 25,000 square foot structure that promises educational opportunities for monks and nuns as well as lay people of all ages, including girls and boys in the Surmang valley. The Pema Chödrön Foundation grant of $150,000—which we are more than halfway to matching—has finally put the completion and launch of the Surmang Shedra in reach, scheduled for the coming summer and fall. 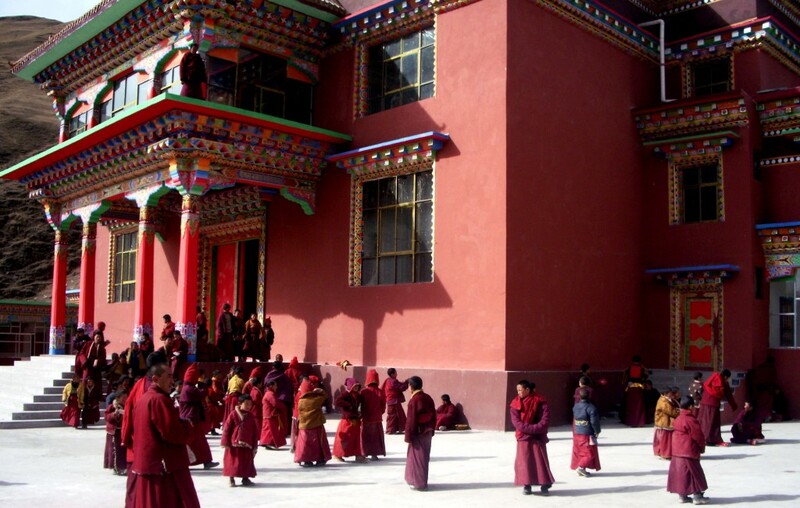 Surmang is the home monastery for the renowned Trungpa lineage of Buddhist teachers. The current abbot, Chöky Senge Rinpoche, the Twelfth Trungpa, who is now in his twenties, will be the leader of the Surmang Shedra. The previous shedra at Dutsi Til—established by Chögyam Trungpa Rinpoche, the Eleventh Trungpa, and his teacher Khenpo Gangshar—was destroyed during the Cultural Revolution. 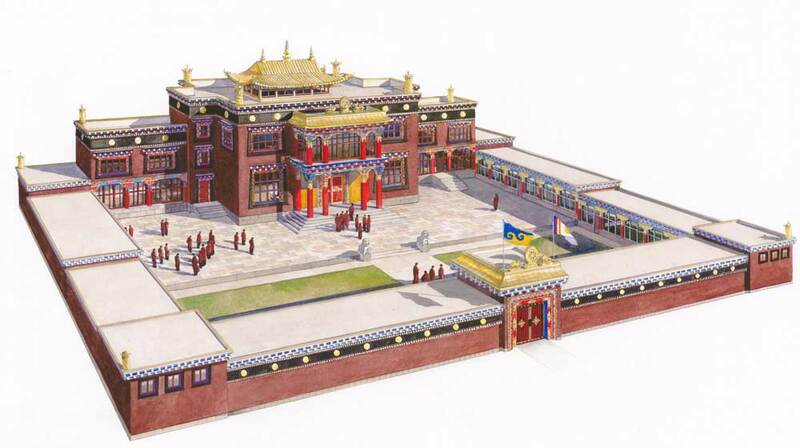 Plans for the new shedra were made between Sakyong Mipham Rinpoche, the son of Chögyam Trungpa, and the Surmang leadership when he visited the monastery in 2001. As part of the plan, Sakyong Mipham created the Konchok Foundation to gather financial support in the West for the shedra and related purposes. In 2003, the Konchok Foundation sent a technical team to Surmang, headed by Bob and Lindy King, the project managers for The Great Stupa of Dharmakaya, to explore the construction requirements. In 2004, architect’s plans were commissioned and the artist’s rendering of the new shedra seen here. Preliminary architectural plans by Steve Vosper. In 2004, funds were raised to begin the construction of the Surmang Shedra. It took six years to complete the basic structure of the new 25,000 square foot shedra building complex and open its facilities to children in the area. In 2010, the shedra complex began being used for the Children’s Education Program, which started in 2008 at another site. This successful program serves more than two hundred local children during peak periods. 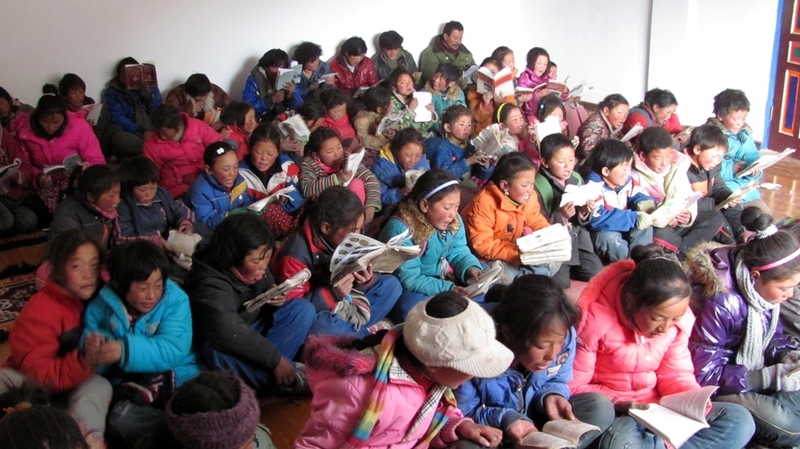 Novice monks also have also been occupying and using the shedra facilities for their education in the basic monastic curriculum, including debate. The building complex needs additional finishing before it is ready to serve as a full shedra for adults. Furnishings, electrical fixtures, landscaping and other items are needed. An opening ceremony will take place over the summer prior to the launch of programs for adult monks and nuns in the fall. Because of the severe poverty in the Surmang region, the necessary funding for the creation of the Surmang Shedra has come entirely from the West. About $750,000 has been expended on the shedra project so far. 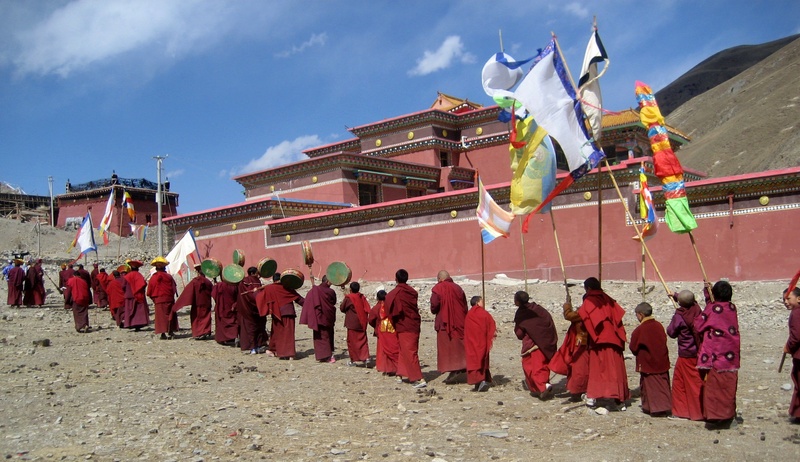 Another $275,000 is needed for the completion, opening ceremony, and launch of programs for monks and nuns, and a final $25,000 will allow us to run the shedra’s first season in fall of 2015. The Pema Chödrön Foundation has stepped forward with a generous matching grant toward reaching the necessary fundraising goal. They have pledged to match all donations on a 1:1 basis until our goal of $300,000 has been raised, contingent on matching donations of $75,000 by December 2014 (which we have exceeded) and the rest by June 2015. We are appreciative that $100,000 has already been committed by donors, and we still need to raise $50,000 by June 2015. We invite you to join us in launching the Surmang Shedra! Please give generously if you are able or contribute whatever you can. Thank you very much to donors who have already stepped up and to the Pema Chödrön Foundation. For those who are able to support the ongoing shedra programs after the launch, commitments of monthly operating support, even in small amounts, are crucial. The single most important cost for keeping the shedra in operation for adults, and also for children, is for food. It costs about $1 per day per person to feed the participants in the shedra programs, whether adults or children, monks or nuns. Please consider Sponsoring a Monk or Nun for $30/month or Joining the Surmang Trust.